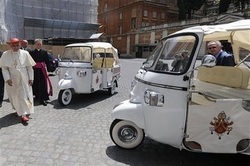 This is our fun attempt to locate all of these wonderful limited edition Piaggio Ape Calessino tuk tuks. We used to own No. 214 of 999 that arrived in Tarifa from Vespa Malaga in August 2010 and then moved to her new home in Arcos de la Frontera in January 2016. This ScoopIt blog provides easy access to all the Calessino news, videos and postings across the world. It is part of our Calessino Parade - please do send us any news you might have or post directly onto our ScoopIt blog. 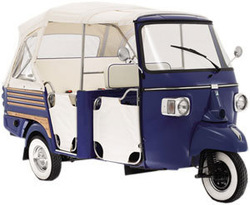 An occasional blog to provide a quick guide to the background, evolution and images of the 3 wheel wonder from Piaggio. The only Calessino Register in the world - unless you can tell us otherwise! It provides a simple searchable database of all of the various editions of this mighty little icon. If you own or drive a Calessino - then you can share your basic details here. Its just amazing how many uses there are for this Italian icon. Here are just a few Calessinos photos to help show what a wonderful form of transport it is ... lots more on the various blogs above. On a sad note, one of the consequences of us using a number of automated search tools for tuk tuk postings across the world is the constant stream of often multiple fatalities involving tuk tuks - nearly all in Asia. It brings home the difference between the highly regulated use of road worthy, carefully driven Calessinos for tours, trips and promotions or just for fun - and the stark reality of children losing their lives on their daily school trip crammed into a battered old Bajaj or equivalent. We must all urge for better safety standards.